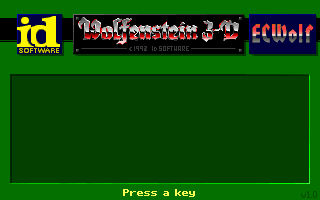 Could anyone find a way to extract the signon screen from Wolfenstein 3D v1.0 or 1.1? I can get it from Dosbox using The Six Depths of Terrorism (v1.1) but the colors are a bit off, enough that PhotoImpact will dither them when I apply the palette. You can find BMP copies of all the sign-on screens in this ZIP file. It includes an additional v1.2 sign-on screen, which never saw the light of day in a DOS version (v1.2 used the v1.1 sign-on image). Thanks for posting these Tricob. You might run the BMP of v1.4 through RecolorBMP and change all the red colors to green. Then the green background would have more detail and variation. I specifically asked for the 1.0/1.1 signon because I wanted the flat look. The 1.4 signon is already in ecwolf.pk3. How to extract graphics from mac-version? Where's the Wolfenstein 3-D Architect?